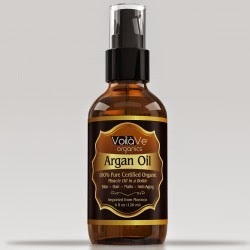 I love Argan oil it helps with a lot of things and it makes your hair super shiny that is why I was really excited to try this Argan Oil by VoilaVe Organics. I tried this a few times and of course they tell you when you use this just use a little well I went a little crazy with it and used to much. What I really love is the packaging also its really nice and I love the pump also. So the next time I used it was perfect. I didn't use to much or to little. I will continue to use this oil in my hair for months to come especially since my hair is a little dry. Bring Your Hair, Skin, & Nails Back To Their Youth! Presenting, the Incredible Miracle Oil in a Bottle...VoilaVe™ 100% Certified Organic Moroccan Argan Oil! VoilaVe™ Organics 4oz Argan Oil is 100% CERTIFIED Organic & ECO and USDA Certified! What it looked like after using look how shiny! !